Does your business produce a lot of waste? If you work in the building industry, chances are your organisation will generate a lot of rubbish that if not disposed of properly, could contribute to climate change, health and safety hazards, and pollution. These aren’t the only dangers associated with waste build-up though because when materials are left to pile up curbside, you could be left facing penalties and fines, which could tarnish your company’s reputation. It is your responsibility to deal with waste as a duty of care, whether it is produced as a result of demolition, agricultural work or construction-related activities. The good news is that there are many builder’s waste removal companies out there willing to help. Specialists in this industry can reduce the workload on your behalf by loading, unloading and recycling waste. In fact, you won’t even have to lift a finger. However, a permit is usually required to treat, store and dispose of materials. Because of this, it is crucial that you find a company that is licensed to perform waste removal from your building premises. A lot of people aren’t aware of the fact that there is something known as ‘waste crime’, and this type of criminality is on the rise. When you consider the fact that waste has a negative impact on the environment, it’s not surprising that it is now considered a criminal offence to dump waste illegally and contribute to landfill leachate. Penalties for waste crime will vary but typically, The Department of the Environment will get involved and will issue a fine to whoever has committed the crime. By working with a licensed builders waste removal company, you can steer clear of fixed penalties and keep your building business in good standing. It would take a lot of effort to recycle on your own, particularly if you are busy dealing with building projects. Waste removal specialists that hold a license understand this and will work hard to transfer waste from your premises, to a facility where it can be sorted for recycling. So much waste is produced in the UK that it would fill the Royal Albert Hall in London every two hours! Despite this, up to 80 percent of the contents of most bins can be composted or recycled, meaning that the builders waste you generate can be reused, thus reducing the need for the world’s precious natural resources. A waste removal specialist who holds a license can be trusted to adhere to strict health and safety standards when collecting, recycling and disposing of waste. 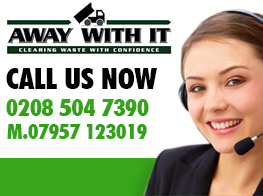 Health and safety is extremely important in the waste and recycling industries. You can guarantee that a licensed waste collector will wear Personal Protective Equipment (PPE) to your building premises, such as eye protection, protective gloves and high-visibility work wear. As a builder who is constantly working on construction jobs of all sizes, you may lack the time to properly sort and store materials in their rightful piles for recycling. While this will be required of people who have waste collected by local authorities, it won’t be required of you if you hire a rubbish collector with a license. Relevant legislation and organisational procedures will be put in place by the crew you hire for the job and all sorting in compliance with the building site operation’s legislative requirements. Hazards will be identified by the team and separated from recyclable materials,before the relevant data and information is recorded.